The Daring Cardmakers have come over all seasonal and asked us to make something "Forever autumn". I love autumn colours and carving pumpkins is great fun at this time of year so I decided to combine those things for my card. My pumpkin carving this year might have to be fun and festive rather than spooky as my friend's little girl really didn't like the Voldemort design I had in my porch last year and I'd hate to scare her off, she's a real cutie! I usually get my templates at Zombie Pumpkins and he has a selection of cartoon characters as well as the scary stuff so I might pick one of those! Inviting a few friends over to help with the carving and maybe to eat pumpkin soup and pie could be a great way to celebrate the season. 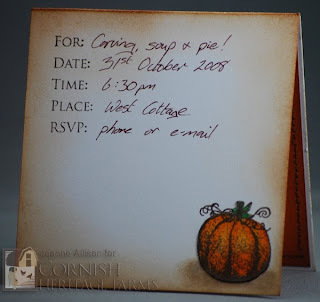 I used the Invitation Essentials set to do inside and out on this one. Cornish Heritage Farms is celebrating a new season, too! A new blog to bring together all the best of CHF creativity has been launched and will feature challenges, highlights from the gallery, news of new designs and lots more. Why not drop by to see what's happening at the Farm? CHF Be Creative - there's rubber to be given away and all you need to do to be in with a chance to is leave a comment! The Canadians have just celebrated Thanksgiving and the Americans are running up to their celebration which kind of had me wondering - why don't we do this in the UK? I know we have harvest festival services in churches and schools still but we don't really have a national day of celebration do we? Odd! Anyway, the thing that got me thinking about this was this gorgeous new image from the Saturday Evening Post line at Cornish Heritage Farms. It's set for release next Tuesday (28th October) and as soon as I saw it I said "I think I'm in love!". I coloured this one with pencils but I've done a couple of others too with watercolours and markers and it's an absolute joy to colour with all of them! I thought a notebook would be a great way to enjoy this image for a bit longer than a card. I removed the covers by gently prising open the spine and made some new, sturdier ones from some chipboard using the originals as a guide to punch the holes. The burlap background stamp was used on the inside of the covers too so the texture carries over. Thanks for visiting today, hope your day is a good one! 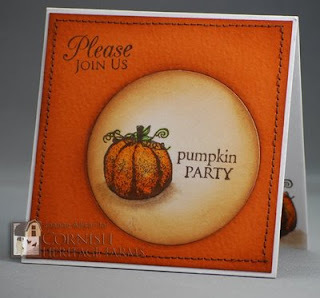 The challenge today over at Cornish Heritage Farms today is to make a shaped card. I rarely think to do this so I thought it would be fun to give it a go! 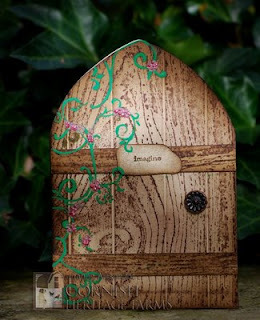 Last month's Craft Stamper magazine featured some fun fairy doors so I decided to do a little adaptation and make a fairy door card. I think this would be great fun for a little girl's birthday or 'just because' card. Perhaps the tooth fairy might even leave it to remind her to make her wish? The top is trimmed to shape with a pair of scissors and I scored the door before stamping the wood grain backgrounder to give the impression of planks. I painted over the stamped swirl with acrylic paint just to give a tiny bit of dimension. The slightly less precise feel of the freehand paint seemed to go with the fact it's representing foliage, too. Tiny dots of 3D paint to represent blossom finish it off. I've added a couple of chipboard 'washers' behind the brad so that the handle really stands proud of the surface and can be used to open the door. Lots of the DT girls are making shaped cards today so it's a worth visiting the links (over on the right) to see what kind of shape they're in, too! Thanks for visiting today, hope you had fun! Life these days is complicated. A quick reminder of the important things doesn't go amiss every now and again, I think: live-laugh-love. If you can do that, you have it licked! 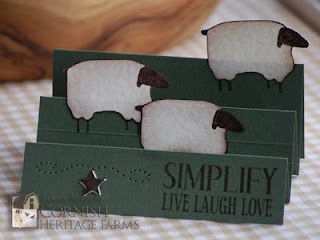 Today's technique lover challenge over on Splitcoast is a cute stair fold card and I thought it would be perfect for a little flock of primitive sheep. Stamps are from the new Primitive Singles line at Cornish Heritage Farms, releasing tomorrow. If like me, you don't have a piercing template, sketch or stamp a swirl onto scrap paper and pierce along the lines, just eyeballing the distance between holes. A little difference just adds to the homespun charm on a project like this! I don't cut out the fiddly bits like the legs on this sheep - just stamp on your project, then cut out the main part of the image from your ivory cardstock and stick it over the image you stamped on your card base and your sheep's legs will look perfect! Too much to make, too little time! Isn't that how we all feel sometimes? Lots of projects we'd love to do and things we feel we 'have' to make as well. Especially come Christmas time when we'd love to send a hand made card to loads of people but it's just not practical to spend hours over each one. 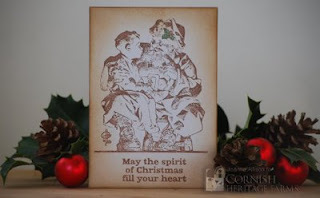 This week, the Cornish Heritage Farms Challenge Chicks mission is to create a quick card. 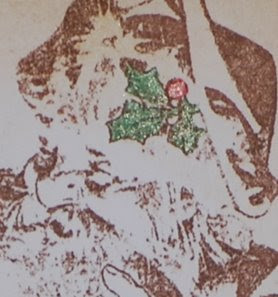 I chose to make a quick Christmas design with this fabulous Saturday Evening Post Santa - even though he looks wonderful coloured in he's detailed enough to stand up on his own without a lot of extra work. I think he looks kind of like an old fashioned etching. I've just added a stamped sentiment, a bit of sponging around the edges and a pop of sparkly colour on the holly - a 10 minute card! All the items for the Think Pink online auction are now on the Think Pink blog so if you'd like to help us raise some money for Breast Cancer Care, please take a peep and consider making a bid - hand made items and stash are on offer! It's a sealed bid auction so you'll need to make your best offer on anything you want - we're aiming to raise as much as we can! 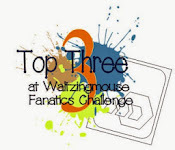 Thanks to everybody who has donated items and those who've already placed their bids too!